"Daddy, am I going to die?" This is what one five-year-old boy asked after having an asthma attack at school. 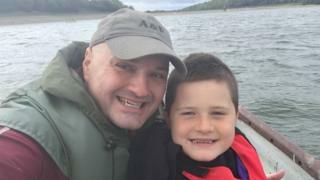 Harry Cook is one of 58,000 children with the condition in Wales, who are at greater risk in September. Last year, related hospital admissions for five to 19-year-olds rose from 37 in August to 115 the month after. Charity Asthma UK blamed changing weather, but also children coming into contact with cold and flu viruses, and mould in schools. It warned parents to be on high alert. "Teachers had tried to give him his reliever inhaler, but it had gone past the point of helping and he was rushed straight to hospital," said Harry's father, Rich Cook, 40, from Cwmbran, Torfaen. "Harry's asthma attack came on so suddenly as when I dropped him off at school he was his normal happy self. The next time I saw him he was in hospital fighting for his life," he said. While Mr Cook praised school staff for how they handled the situation, he said there needed to be greater awareness of the problem. Asthma is a long-term inflammatory disease of the airways of the lungs, which makes it difficult to breathe, and Harry's experience last September is not uncommon. Between August and September, hospital admissions have traditionally spiked for the age range in Wales: from 23 to 108 in 2013; 42 to 75 in 2014; 40 to 107 in 2015; 46 to 93 in 2016; and from 37 to 115 last year. The fact there is not the same spike for over-20s - there were 167 admissions in August 2016, with the figure dropping to 156 the month after - has led to research and the warning. In 2017, there was a modest rise from 131 in August to 147 among over-20s, the Welsh NHS figures show. "Going back to school should be an exciting time for children, but many could end up in hospital fighting for life after an asthma attack," said Dr Andy Whittamore of Asthma UK. "This is extremely distressing for a child and their parent. "It could be avoided if parents know how to spot their child's asthma is getting worse and know what to do if their child is having an asthma attack." The charity also highlighted how lack of a routine during the summer holidays meant parents may not always remember to give their child preventer medicines. Because it builds up in the system over time, helping to protect airwaves, not giving it exposes the youngster to asthma attacks triggered by cold and flu viruses. Asthma UK has given advice, including giving puffs through an inhaler every 30 to 60 seconds if it appears a child could be having an attack. A Welsh Government spokesman said: "We recognise the continuing impact asthma can have on people in Wales, especially children and young people, and work with partners to support better diagnosis and treatment of respiratory diseases and improve respiratory care services across the country."